Here at Shadow Hill Kennel and Farm, we believe that conformation and other performance dog sports go hand in hand since only a healthy, intelligent and sound dog, what the conformational standard stipulates, can truly excel in these activities. 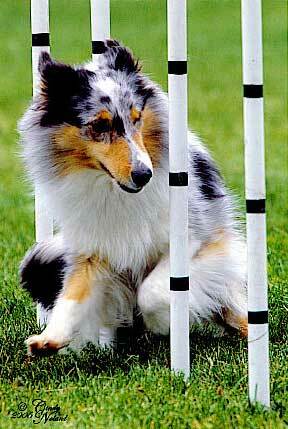 A low and long sheltie, one with a poor front or rear, one with either too much or not enough neck, something unbalanced, a dumb sheltie, one with poor temperament, and even a sheltie with too much coat or too much bone would have a hard time excelling in performance sports. We feel that if a dog cannot perform, it should be weeded out of a breeding program regardless of how pretty it may be. 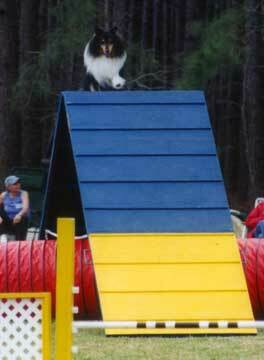 We have produced many dogs that have shined in performance areas such as agility, herding, obedience, rally and even tracking. 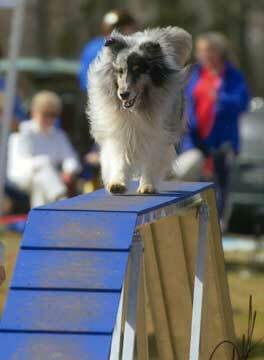 In fact, all our dogs here at Shadow Hill are trained in agility and enjoy playing on the equipment even though we don’t always have the time to go out and pursue titles. However, we have placed many dogs who have gone on to win a great deal of titles at the end of their name; to name a few: Shadow Hill Mad Dash at Plails NA, NAJ, CD, HT, RN; Shadow Hill Ahead By An Edge CD, RA; BIS/BISS Am/Int. CH Shadow Hill’s Air Force One OA, OAJ; CH Shadow Hill’s Leading Edge OA, OAJ; Shadow Hill’s Dream Maker NA, NAJ; Shadow Hill’s Blue Steel UDX, OA, OAJ; Shadow Hill’s Daisy Duke PT; Shadow Hill Faerie Treasure PT, HSAs, JHD; and Shadow Hill’s Dandee O’Lion CD, RN. If you are interested in acquiring a sheltie for performance sports or interested in getting started in one, please contact us through our contact link at the bottom of this page. Pictured in the top right photograph is Shadow Hill Kindred Spirit MX, MXJ, NF out of Shadow Hill's Polaris ROM and Shadow Hill Satin Pillow ROM. Thank you MaryAnn Chappelear for the phenomenal work you've done with Kinsey and for the lovely photograph.